> Is there still a place for gender in this era of mitigation? For a long time, agriculture was a focus of worldwide debate as a cause, but also as a victim of climate change. The fact that agriculture can also contribute to mitigating climate change goes uncontested. However, there are different opinions regarding how great and how feasible this potential is. Land use change through deforestation and conversion of forest into grassland and cropland today accounts for about 20% of all greenhouse gas (GHG) emissions. In addition, agricultural uses such as livestock breeding and crop cultivation cause another 10–12% of the total GHG emissions – predominantly methane and nitrous oxide, whereas less than 1% of the total human-induced carbon dioxide emissions originate from these agricultural activities. A reduction in methane and nitrous oxide emissions through more targeted application of fertiliser, better water management in rice cultures and more climate-friendly livestock production systems would have the most effective impact on climate change in the short term. In addition to these measures, however, the State of the World Report 2009 also recommends strategies to increase soil carbon through sustainable land management (SLM) and thus use the soil as a carbon sink. There are four main areas of focus: enriching soil carbon through SLM, developing high-carbon cropping systems, protecting carbon stores such as forests and grassland, and rehabilitating degraded areas. But what potential do soils have for sequestering carbon dioxide? Carbon is constantly exchanged between the atmosphere and the soil: on the one hand, carbon is stored in the soil in the form of organic matter, and on the other hand, it is released into the atmosphere when the vegetation cover is removed and the topsoil is depleted through intensive soil tillage. Today around 1600 billion tons of carbon are stored in the soil, about three times the amount stored in the vegetation cover. However, soils could store substantially more carbon dioxide than they do today. Sustainable land management is key in this regard. Soil organic matter can be increased considerably by using sustainable cultivation methods such as, for example, organic farming, agroforestry, minimum tillage, green manuring, and mulching. Optimistic estimations indicate that 5–15% of carbon dioxide emissions from fossil fuels could be fixed in the soil each year. However, the fact that this store is limited, and the risk of carbon dioxide being released back into the atmosphere at a later stage, prohibit using these measures to replace efforts to reduce fossil carbon emissions. Enriching soil carbon can do no more and no less than complement reduction of fossil carbon emissions. Nevertheless, enhancing soil carbon also leads to improved soil fertility and thus offers very basic advantages. 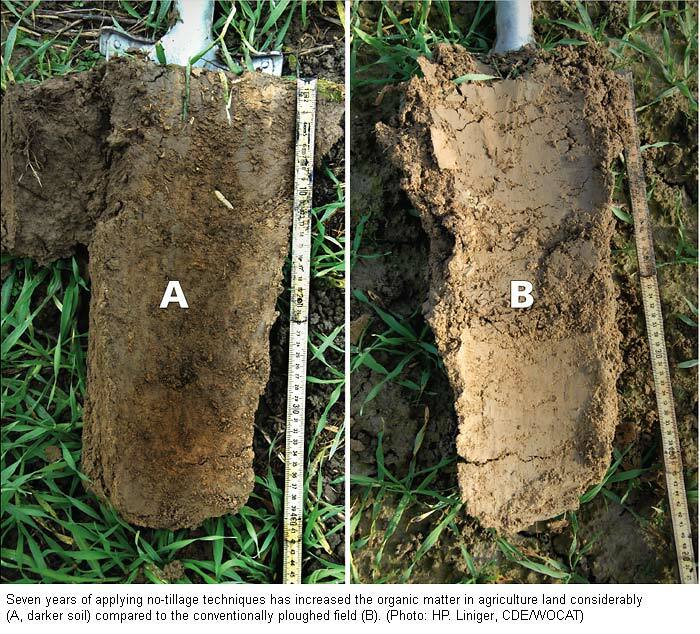 A higher carbon content improves water storage capacity and water infiltration in the soil, enhances the conditions for soil fauna and stabilises the structure and thus the carrying capacity of the soils. Thereby SLM makes an important contribution to food security and increases the adaptive capacities of land use. An overview study that is currently being completed within the TerrAfrica framework is expected to show how SLM can contribute to climate mitigation as well as adaptation in sub-Saharan Africa, based on an analysis of different SLM methods and their potentials for mitigation and adaptation. In future the focus will be on promoting combinations of different SLM strategies – as they are proposed also in the State of the World Report – and adapting them to the various local conditions. However, this task must not be left to the individual farmers alone. Policy-makers must work towards this goal as well. The initiative of the Terrestrial Carbon Group is an example pointing in this direction. Recent food and financial crises have triggered a new global land grab. “Food insecure” governments that rely on imports to feed their people are snatching up farmland in poorer countries for offshore food production. Hungry for profit, food corporations and private investors are investing in foreign farmland as an important new source of revenue. As a result, ownership of fertile agricultural land is becoming increasingly privatised and concentrated. The land grab boom shows that many countries and governments are loosing faith in the international market as a secure source of food supply. Due to the land grab, more and more workers, farmers and local communities are loosing access to land for local food production: the very base of food sovereignty is being eroded. Moreover, these deals are further entrenching export-oriented agriculture, thereby increasing the vulnerability of local food supply systems. While the land grab can be seen as part of a new consensus that investment in agriculture is good and very much needed to secure our food supply, this kind of investment goes in the wrong direction. The most critical question is: what happens in the long term when control over a country’s farmland is handed over to foreign nations and investors? What is understood by innovation in the context of natural resource management and development cooperation? The term “innovation” today comprises all activities and processes related to the generation, dissemination, adaptation and use of new technical, institutional and business knowledge. Therefore, the term can designate a new product or technology, as well as a new market, strategy or institution. Even though on the African continent the more traditional “technology push” model continues to be applied frequently, many experiences have been made with the innovation approach, as well. These experiences were presented at a symposium in Uganda in 2006, and a selection of them can now be found in a new book entitled “Innovation Africa”. The volume’s main focus is on conceptual and methodological developments in agricultural innovation systems. In addition, the book also highlights results and experiences from different contexts, such as livestock production, potato and rice cultivation, and communal information and communication centres. Development cooperation aims to achieve sustainable changes that benefit, above all, less favoured regions and groups. A key issue is how to institutionalise approaches that validate experiences and results achieved in a limited setting and expand them into the public policy framework, in terms of access to basic services, dignified living conditions, renewal of natural resources, and democratic management. In this context, the ASOCAM network led and facilitated a regional study in 2008. This study showed that influencing public policy and practice helps to enhance expansion and the sustainability of the development processes achieved in projects. Nonetheless, the advocacy strategy must be a reflexive process, rather than a reactive one. Moreover, it should promote inclusion and co-responsibility in relationships among stakeholders. Considering the dynamism of the Latin American context, time should be set aside and a mechanism established to update situation analyses and adjust strategies when necessary. Moreover, it is important to pay special attention to the sustainability of policy proposals and, as a development cooperation agency, to reserve funds and resources for accompanying policy advocacy efforts. The world population is using more and more freshwater. Between 1900 and 2000 the number of humans on earth quadrupled, whereas their water consumption has multiplied by a factor of nine. In many regions of the world, water scarcity will increase dramatically over the coming years, severely impacting food production, energy production, the environment, the economy and human security. In the present document, industrial circles present their responses to the impending “water bankruptcy”: farmers as the most important water users must urgently begin to manage this resource more efficiently, according to the slogan “more crops with fewer drops”. In addition, the international system of agricultural trade must be made more equitable: it should pay off for water-poor countries to import water-intensive foods instead of producing them in their own country under precarious ecological conditions. In the energy sector, as well, more attention must be paid to water efficiency: solar and wind energy should be promoted, not biofuels. Finally, it is of key importance to improve water infrastructures and water management. The authors call upon governments to live up to their leadership role when it comes to implementing these measures, and to involve all actors in the process. In our opinion, the latter is crucial to ensure that the needs of the poor are not sacrificed for large-scale economic interests in water. Source: The Bubble Is Close to Bursting: A Forecast of the Main Economic and Geopolitical Water Issues Likely to Arise in the World during the Next Two Decades. Draft for Discussion at the World Economic Forum Annual Meeting 2009. World Economic Forum Water Initiative. January 2009. 68 p.
The issue of conserving biodiversity and ecosystem services has undergone a major transformation over the past decades. The “simple” species conservation approach has been replaced with a holistic view that takes account of causal relations and dynamics between different levels and sectors in a more comprehensive manner. Expectations towards institutions that are in any form active in the biodiversity discussion have changed accordingly. Strategists and decision-makers are expected to receive inputs from the various knowledge levels (e.g. science, operational level, local stakeholders). Moreover, elements such as uncertainty and risk call for flexibility and continuous adaptation in biodiversity management. The authors of this paper state that the current institutional framework is incapable of meeting these needs. They identify weaknesses among all actors in knowledge exchange, valuation methods, communication, or capacities available. Therefore, they propose an intergovernmental platform that can support all partners as a common basis and, as an integrative element, can counteract dissipation of efforts. At the same time, the authors also point out tasks that should not be performed by this platform, such as research, development of indicators, lobbying, and others. The International Institute for Environment and Development (IIED) and the Natural Resources Institute (NRI) recently conducted a three-year project on small-scale producers and standards in agrifood supply chains. The project investigated the opportunities and constraints for African small-scale producers of horticultural products of applying private voluntary standards (PVS) with a view to participating in the international market. This publication is based on the project’s case studies examining the application of PVS by small-scale producers of horticultural products in various African countries. help those who are unable to comply with the standards to target their products to local and national markets. 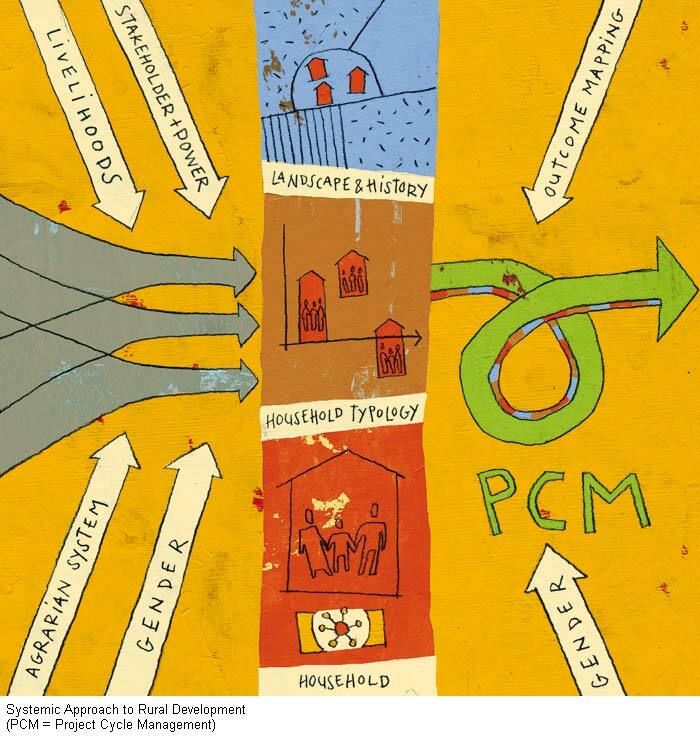 Before launching a new rural development programme, a number of issues must first be addressed, such as the gap between decision-makers and the realities of the rural poor, as well as the heterogeneity of household livelihoods. 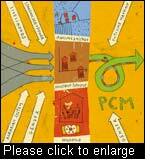 In addition, the process of selecting the most suitable approach (gender, agricultural system, livelihoods etc.) is highly complex. The systemic approach to rural development (SARD) supports development practitioners in finding locally adapted solutions. The added value of this approach lies in the fact that it acts on three levels: household livelihoods, the typology of these households and their relationships with other stakeholders, and finally the landscape and how its characteristics reflect local history. This publication is designed to serve as a manual for the use of such approach. It draws on experiences and analyses by means of various methods used throughout the course of the project. For example, a SDC project in Tanzania which applied SARD managed to identify the different stakeholders involved, as well as the links between them. This typology then enabled decision-makers to estimate the effects of their interventions more accurately. Is there still a place for gender in this era of mitigation? Throughout the course of history, women have played a leading role in forest conservation, reforestation, management of local resources and energy consumption. Many of these sectors have taken action to reduce greenhouse gas emissions. Yet, in this era of mitigation, the role which women had previously played in such efforts tends to be brushed aside, while the female population itself has been relegated to the status of mere victims of climate change. The present publication advocates a return to a situation where women are agents for change. Studies on forest management and conservation in Cameroon and Nepal, for example, show that the men are mostly concerned with extracting the timber, while the women are typically involved in afforestation efforts. Such activities are important as they can help stabilise the ground and also provide products (energy, food, medicine) which enable the women to boost their family income. If institutions fail to consider women’s concerns when making decisions, any programme they launch to mitigate climate change risks losing not only the significant knowledge which these women have, but also their potential as key allies and promoters. 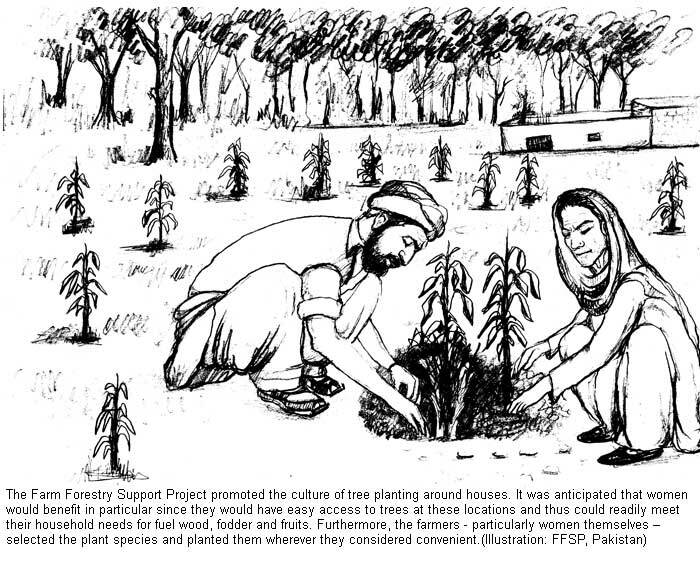 A farm forestry project was carried out in Pakistan between 2000 and 2008. Its focus was on helping communities in dry areas to integrate trees into their farming system and to generate added value through the marketing of forest products. One of the positive outcomes of this project was the social empowerment of women and other marginalised groups. The present publication is the result of a unique but intense five-day “writeshop”, during which the final report was put together by the authors, illustrators and editors. Prior to the writeshop, the key topics were identified – issues of land ownership, tree nurseries, market sectors and environmental services, to name but a few – and the main authors of each chapter were selected. The authors then submitted a draft of their chapter to specialists for peer review. All resulting comments were then incorporated into the revised version before the final editing process during the writeshop could begin. We were particularly interested in both the analysis of household livelihoods in arid zones and the changes needed to give households a route out of poverty, and in approaches to guaranteeing human rights and working in conflict zones. The black and white illustrations make an important informative and aesthetic contribution to the work as a whole. In 2003 an extremely hot summer claimed thousands of lives throughout Western Europe. In addition, it caused a drop in yields: in maize, yield losses reached up to 30%. Thanks to international trade, government support, and insurance coverage, these yield losses did not lead to a major global price rise or to a food crisis. In future, this is expected to be different. A scientific study shows that by the end of the present century, in many moderate areas the hottest summers known will become the norm. In the tropics and subtropics, normal summer temperatures will most likely even exceed any extremes measured so far. Regions like the Sahel, where the food situation is precarious even now, will be affected first. In these regions the annual temperature fluctuations are smallest, while the expected rise in temperature is highest. The impact on food security could be dramatic: since yields will be affected by hot summer temperatures worldwide, it will hardly remain possible to compensate losses in one region with high yields in other regions. The future will look grim unless investments in the development of heat-resistant crops and adequate irrigation systems are stepped up.